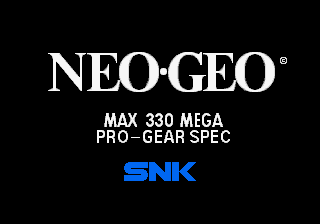 The Neo Geo was SNK's brilliant plan to not only bring the arcade to new heights, but also bring the arcade home. Had a rental system, memory cards, MAX 330 MEGA, and $599 pricetags. Maybe you've heard of it, since it was the most popular arcade platform for third-party developers of the early 1990s. When discussing the Neo Geo, it is important to know that the MVS (Multi-Video System) is the arcade unit whereas the AES (Advanced Entertainment System) is the home unit. The Neo Geo CD is a separate system entirely, which used CDs instead of carts to lower the price of the games at the expense of incredibly-slow loading times and a much lower amount of RAM. In most cases, games were given simultaneous Japanese, US, and European releases; as a result, data for all three regions is present in the cartridge. In some cases, setting a game to a region that it was not officially released in will reveal unused options, gameplay differences, or even an (un)finished translation. Document "developer mode" and the crash handler. Every game released for the Neo Geo contains the data for both its AES and MVS versions. Early Neo Geo models even had the option to swap between the two modes. The Neo Geo has some test menus accessible, but these are often exclusive to one mode. These dip-switches are physically present and used in the MVS system, and are used to change values in the Test Mode, like Region, Blood, Lives, Timer... It works basically as a cheat menu of sorts. There are a total of 16 Software DIPs. The home console version of the Neo Geo has two pairs of eight DIPs each, which are called Debug Dip-switches. 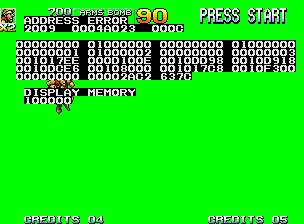 Unlike the software DIPs, they often have debug-related options, like job meters, invincibility, and sprite and sound tests, among other things. These are disabled by default, and there is no way to modify them other than modding the console to use a special BIOS to make them available, like the Debug BIOS and Universe BIOS. Some emulators, like Kawaks, have options to enable these Debug DIPs. This page was last modified on 16 January 2018, at 18:12.